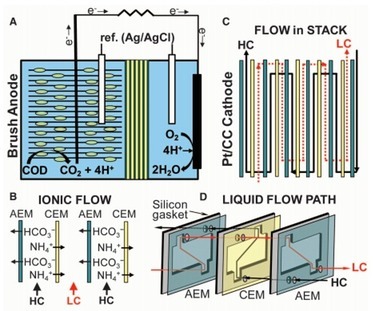 Reverse electrodialysis allows for the capture of energy from salinity gradients between salt and fresh waters, but potential applications are currently limited to coastal areas and the need for a large number of membrane pairs. Using salt solutions that could be continuously regenerated with waste heat (≥40°C) and conventional technologies would allow much wider applications of salinity-gradient power production. We used reverse electrodialysis ion-exchange membrane stacks in microbial reverse-electrodialysis cells to efficiently capture salinity-gradient energy from ammonium bicarbonate salt solutions. The maximum power density using acetate reached 5.6 watts per square meter of cathode surface area, which was five times that produced without the dialysis stack, and 3.0 ± 0.05 watts per square meter with domestic wastewater. Maximum energy recovery with acetate reached 30 ± 0.5%.